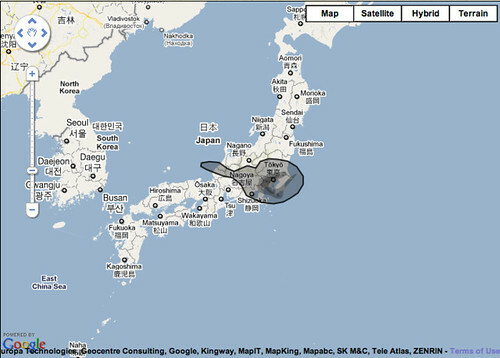 This is the Gulf Oil Disaster superimposed on a map of Japan if the spill had originated in Tokyo. The website, If It Were My Home, allows anyone to ‘bring home’ the catastrophe to their doorsteps to better understand the scale of the catastrophe. As you can see from the map, the spill would smother the entire Kanto region, stretching out past Nagoya, over to the other side of Honshu to the East Sea. The oil could easily drift down to Kyoto and Osaka. Yokohama and Tokyo Bays would be thick with petroleum far out into the Pacific. I was curious about some of the other places I’d called home. 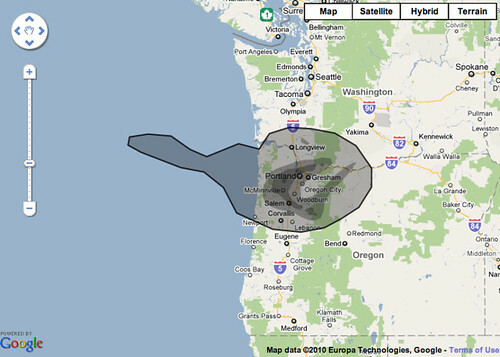 Most of my friends live in Oregon, so I put the spill on Portland. Most of the Columbia and Willamette Rivers would just be a mess, but it wouldn’t quite reach Eugene. If the spill was turned 90 degrees, however, it would stretch from Eugene to Vancouver, snuffing out the largest cities of the Pacific Northwest. If the spill was centered in San Francisco, Governor Schwarzenegger would find himself covered in the gunk in Sacramento. The California wine industry would be wiped out, and so would other agricultural regions that are major producers of strawberries and kiwis, soybeans and rice, to name a few. You can also say goodbye to everything from Silicon Valley to sensitive breeding grounds for the elephant seal. Turned on its side, the spill could sprawl all the way down to Los Angeles. And if the spill gushed from LA, it would ooze past Palm Springs in the east and Santa Barbara in the west. Hollywood wouldn’t have to film blockbuster disaster films. They’d just have to shoot the documentary right outside their blackened homes. Over New York, all the bankers who live in Connecticut wouldn’t be able to escape. Long-suffering cities like Philadelphia and Newark, would be buried. Boston, unfortunately, would remain unscathed. The UN would be paralyzed. But at least we’d be able to wipe away the banking industry. 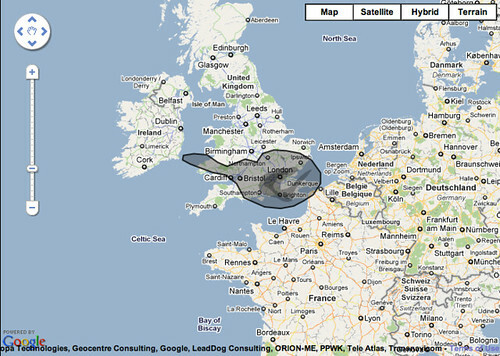 A spill originating in London would lap the shores of Ireland and France. Londoners would have more to complain about than just the bad food and the late trains. While the oil has stopped gushing, the Gulf Oil Disaster is still a catastrophe. I’ve had viscerally nauseous reactions to reading about the spill and seeing wildlife destroyed by it. So much so that I’ve had to stop reading about it. I’ve felt a combination of helplessness, anger at the arrogance of corporate greed, frustration with government collusion, and guilt over my own dependence on fossil fuels. Hopefully, this calamity will kickstart a systemic re-evaluation of our energy policies, and a deep reflection of our petroleum addiction. Then action. Otherwise, we’ll have learned nothing.